the ground running in 2013! We’ve made our New Year’s resolutions (and so far, we’ve actually stuck to them! ), started planning some fun promotions and set aside time in our planners for educational opportunities, workshops and tradeshows. We’re looking forward to shining even brighter this year…and hope you’ll join us! our January member spotlight. As one of the most sought-after children’s photographers in the San Francisco area, Sara focuses on the wonder, complexity and joy of childhood in her photographs. She has a unique and fresh approach to portraying a child’s lifestyle and has recently shot for companies like Amazon and Wired. Sara will bring her West Coast vibes to Charleston this spring as she joins us as a headline speaker at the 2013 NAPCP Retreat. In this issue, we get a little glimpse inside her world using her Instagram photos – don’t miss it! right now. Made in the USA, FOTOSTRAP is a vintage-inspired camera strap that works well and looks even better! Dedicated to giving back to the community, FOTOSTRAP donates a portion of proceeds to the non-profit organization, Fotolanthropy. This month, FOTOSTRAP is giving away a fashionable camera strap to one lucky winner! More details are inside this issue. 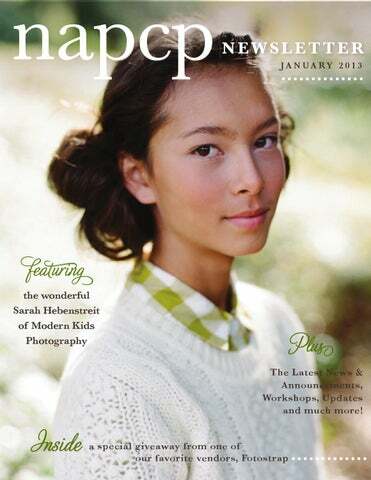 The NAPCP January 2013 International Image Competition is underway. Don’t forget to submit your photos by Thursday, February 14. In addition, registration for the 2013 NAPCP Retreat is officially open. We hope everyone can join us April 8-11 at the Francis Marion Hotel in Charleston. Register for the retreat before January 31 and be entered to win the ultimate giveaway package. More details here! scenes look at all the exciting projects we’re working on this year! We have a good feeling about 2013… we’re glad you’re along for the ride! Vendor Download Page We are super excited to share the launch of a new feature on the NAPCP website! Several of our amazing vendors have contributed FREE downloads exclusively for NAPCP members. These downloads include template designs, educational videos, and much more! We will be adding a few more downloads this month so be sure to check it out! The page can be found under the "Resources" tab. Kids Photography shoots for some of the best kids brands around the world. She has a BFA in Photography from the Minneapolis College of Art & Design. When she's not shooting she is eating her way around San Francisco, designing products with her husband, or collaborating with her family's bookbinding business in Pennsylvania. Read on to learn about how Sarah got her start as well as a peak at the must haves in her camera bag! We love your editorial, modern approach to capturing children and families. How did you develop your style over the years? The history of photography is really inspiring to me. I look at mostly fine art and editorial photographers over the last 150 years. Some of my favorite photographers are from the 1970s onward and are shooting mostly in color. I have learned to rarely look at other portrait photographers so that I can keep my work feeling fresh. I think our photographic eye is easily influenced so you want to make sure you are looking at many types of imagery not just your own genre or you will find yourself in a creative rut rather quickly. Also, my mother is a self-taught photographer who has been shooting for over forty years. She's amazing and she inspires me. If you werenâ&#x20AC;&#x2122;t a professional photographer, what would you be? I love the idea of being a chef but I don't like the hours instead I would love to have a design studio with my husband where we make all sorts of beautiful and useful products. Who are some of your favorite artists/photographers? I am still very much in love with fine art portrait photographers. Some of my all time favorites are Rineke Dijkstra, Justine Kurland, Stephen Shore, Alec Soth, August Sander, Sally Mann, and many more. Any new and exciting things in the works you want to tell us about? Oh well this is on a personal front but my husband and I finally moved in to a house we've been renovating in San Francisco over the last five years. I'm enjoying that so much (thank goodness for Pinterest). Thank you so much. I'm excited to meet everyone in Charleston! To see more of Sarahâ&#x20AC;&#x2122;s work, please visit her site here! I have so much gear but right now these are things I love and couldn't live without! photos. Enjoy behind the scenes looks at some of her shoots as well as her family and friends. FEATURED VENDOR FOTOSTRAP Professional photographer Katie Norris founded Fotolanthropy in the summer of 2011. As this giving based business continued to grow, she began to see a need for a way to fund Fotolanthropy and keep it going. Katie had always desired to design her own camera strap that would compliment todays styles after wearing her same old black camera strap for years. With Fotolanthropy continuing to grow and tell stories, Katie decided to act on her dream and design a camera strap to sell and to use a portion of each sale to help fund Fotolanthropy!